Last year, a visualization that turned data on our planet’s temperature into a gradient of colorful stripes made a splash by showing how severely the world has warmed to-date. Now, a new visualization riffs on that by showing what the future holds depending on when and how fast humanity cuts its greenhouse gas emissions. And folks, the choice is pretty stark. Scientists and policymakers often talk about the global average temperature and what things will look like in the future, but it can feel vague and hand-wavy. But plot it in technicolor and suddenly the future becomes a lot more visceral. That’s exactly what German engineer Alexander Radtke has done with his new illustration, which extends last year’s climate stripes out to 2200. 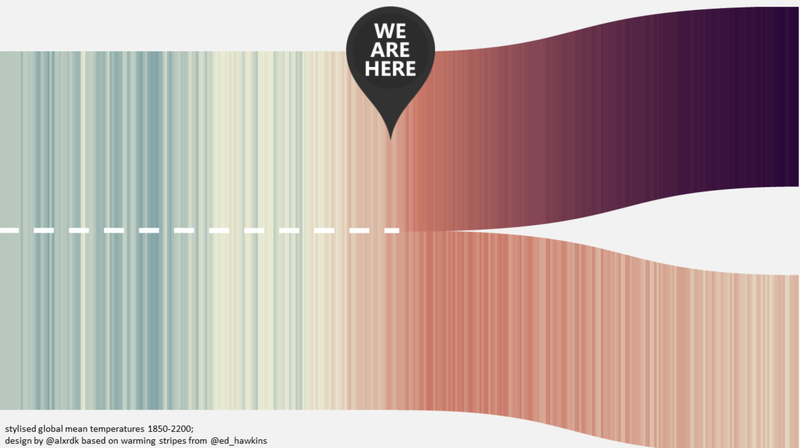 Each stripe represents the annual global temperature’s departure from average under two different scenarios that leading climate scientists have created. 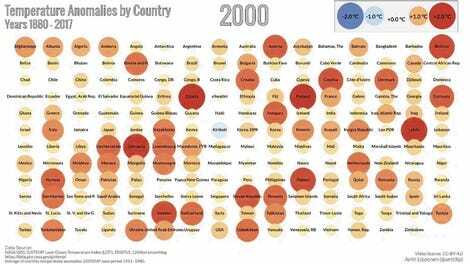 In one, carbon pollution continues unabated through 2100. In the other, emissions peak in the next 12 or so years and begin their decline. I could bore you with all sorts of details on the work that went into creating these scenarios, but Radtke’s visualization cuts to the chase. In a world of unmitigated emissions, the planet would warm up to 9 degrees Celsius (18 degrees Fahrenheit) above average (which in this case is 1961-1990) by 2200. That’s the pathway on the top, and it would be a hellacious world inhospitable to civilization as we know it. But as Radtke’s bottom illustration shows, cutting emissions rapidly means the global average temperature would peak near the 1.5 degree Celsius (2.7 degree Fahrenheit) threshold by mid-century and then begin to decline into the future. You can almost feel the fire of global warming being put out in the second visualization. He also created images for pathways between these two, showing what awaits if the world takes mild or belated action to address carbon pollution. And with a “you are here” reminder placed right in the middle, the crossroads the world is at are clear.